Storm battered Marbella is bracing itself for more rain on Sunday. After the chaos of Tuesday’s downpour that brought widespread flooding and damage to the town, Spanish Metrological Office AEMET issued a yellow warning for storms tomorrow from 7am-8pm. The heavy rain is a result of Hurricane Leslie crossing the Atlantic Ocean heading toward Portugal and Spain. Forecasters saying the “Zombie” storm will bring heavy rain, high winds and dangerous surf to western parts of the Iberian Peninsula. 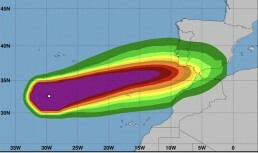 Forecasters said sections of Portugal will see near hurricane-force winds, while parts of western Spain are expected to be hit with tropical storm-force winds.). Portugal’s weather service issued red warnings — its highest level— for high winds or dangerous coastal conditions for 13 of its 18 mainland districts, including Lisbon, where it said the storm’s effects will start to be felt around 6 p.m.
Looks like it’s time to batten down the hatches. Again!